Bivens, R, Hoque, Anna Shah, Farrall, Joanne, & Rajani, Nasreen. (2017). There’s an App for that? 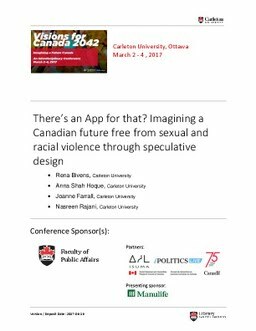 : Imagining a Canadian future free from sexual and racial violence through speculative design. Presented at the Visions for Canada 2042: Imagining a Future Canada, Faculty of Public Affairs.